Creating specialist shapes is more complicated than you might think. RAPAPORT... 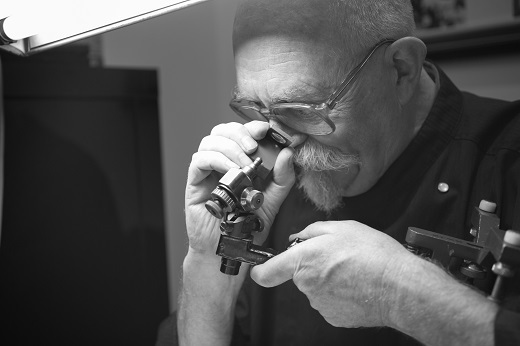 Creating and launching a proprietary cut is difficult for almost any diamantaire. The costs can be prohibitively high, even for larger companies. In addition, the weak prices of non-round goods mean there’s no guarantee the venture will boost profits. Take the example of Pieter Bombeke (pictured), one of Antwerp’s best-known cutters and a specialist in making innovative, non-generic shapes. Bombeke has created many shapes of his own, but until recently had only patented one: Solomon’s Seal, which uses an optical effect to make the Star of David appear on the stone. He has since begun registering another two creations: the Xiao Long — Chinese for “little dragon” — and the Dreamcatcher, which has a spiral-like appearance. It’s a difficult business. Many bespoke cuts don’t lend themselves to large-scale production, and are therefore hard to make money from, Bombeke explains. Cutters such as Bombeke have many proprietary shapes under their belts, yet can’t afford to protect and defend every design, explains Alexander Dayekh of Antwerp-based Dayekh Gems. It’s a vicious cycle in a market where dishonest competitors have been known to buy a tiny diamond with a particular cut, put it through a stone-scanning machine, and reverse-engineer larger, more expensive versions of that same branded cut. Even if the original craftsman has patented the stone, impostors can simply change one facet and win any ensuing court case. “It means you’re paying for protection but can’t enforce it,” Dayekh sums up. The imperative to protect intellectual property means relatively high legal fees in the initial stage. Those amounts rise sharply if another company contests the patent, or if the need arises to sue someone who has stolen the design, especially if the culprit is in another country. That’s on top of the cost of buying rough and marketing the product. Simulation technology lets artisans experiment with cuts, but they still have to do some of the work with real stones. More established companies can at least handle the high startup costs. New York-based Hasenfeld-Stein spent close to $70,000 obtaining a patent for its FirePrincess cut (then called FireMark), estimates company president Hertz Hasenfeld — and the process took three years due to several challenges to the application. The launch of the cut in 2008 was an attempt to create a more attractive version of the princess, which Hasenfeld says was mainly a lower-end stone because cutters manufactured it to maximize yield rather than for its beauty. The firm, a De Beers sightholder, later introduced another cut, the FireCushion, at a much lower cost, as it received a patent uncontested in just three months. The FirePrincess and the FireCushion initially commanded a 15% price premium over their generic counterparts, but required 15% extra rough, negating any direct profit. For the FirePrincess, both percentages are now down to about 7% or 8% due to a market-wide improvement in the quality of generic princesses. However, Hasenfeld sees the products as a success, since they have brought in committed repeat buyers. One of the largest costs is maintaining the right inventory of the special cut, Hasenfeld adds. Retailers want to be able to buy merchandise on demand, but having too much stock is expensive. Smolensk Diamonds, a subsidiary of Russian manufacturer Kristall Smolensk, has less happy memories of its escapades in branded cuts. The company had a group of experienced polishers in Russia who were working on creating new cuts, but discontinued that operation about 10 years ago because it didn’t bring in much business, recalls Raymond Cohen, Smolensk Diamonds’ manager in Belgium. “It’s good to have a new cut, but if you don’t have somebody who’s interested in it, you don’t make it,” he says. The huge costs of producing and marketing new cuts means they can’t get off the ground unless there’s a solid client base willing to buy the goods repeatedly, Cohen explains. This was generally not the case for Smolensk. In addition, slicing up rough diamonds for a speculative purpose, and for a relatively low volume of polished, made the project difficult, even for a large company like Smolensk. “If you need one kilo of meat, you’re not going to buy the whole cow,” Cohen says. Smolensk’s one success was the Phoenix, which took rectangular rough that had little other purpose, and used it to make a longer, cut-cornered version of the princess. It developed a selling arrangement with a UK jeweler, and continued making the Phoenix until two or three years ago. Even so, there were difficulties. The Phoenix didn’t sell for any premium, and Smolensk sometimes found itself a victim of its own success when demand outpaced supply. Business development can also be “disastrous” given the massive marketing costs and the low chances of turning the endeavor into a commercial success, Cohen warns. The May decision by the Gemological Institute of America (GIA) to place branded-cut names on its grading reports — as long as the manufacturer can produce the relevant patent documents — could help companies in that regard. Hasenfeld-Stein, which is participating in the GIA’s program, has inscribed the FireCushion brand on girdles and certificates before, “but nothing speaks as loud as the top line saying FireCushion or FirePrincess,” Hasenfeld notes. Dayekh also anticipates benefits from the GIA’s move, though he notes that other laboratories, such as HRD Antwerp and the International Gemological Institute (IGI), have been recognizing proprietary cuts for a while. ‘Get rid of the lawyers’ An Antwerp-based manufacturer aims to solve the many problems artists encounter when they try to create new diamond cuts. Alexander Dayekh of Dayekh Gems wants to open up patents so that any trader with basic cutting skills can study how to make a protected design. To do so, they must attend a course at the Antwerp Diamond Guild (ADG), Dayekh’s new creation, where they will learn from the experienced polishers who invented the shapes in question. In the regular system, companies pay royalties and licensing fees to inventors to use their designs. That involves complicated calculations based on stones’ values, and is too expensive due to legal fees, Dayekh argues. “We want to get rid of that, get rid of the lawyers, the patents,” Dayekh says. Instead, cutters will take the knowledge they learn at the ADG back to their factories, buy their own rough, and keep the profits for themselves. The inventors make their money from the course fees and get a percentage of the price of the ADG’s “SmART” certificates, which students can buy to accompany the diamonds they end up making. The ADG will also help companies price their special cuts — a difficult task at present. The guild will measure stones’ light performance with the help of Wisconsin-based Gemex Systems, value the diamonds based on that result, and state those facts on the SmART certificate. While cutters aren’t obliged to get the certificate (which will cost about the same amount as other labs’ grading reports), their diamonds will be difficult to price and have limited liquidity without it, Dayekh argues. To remedy the situation, he wants to create an open library of artistic cuts so craftsmen can easily find out what others have already made. This could significantly help reduce costs for traders who experiment by cutting up expensive diamonds, and the contents could also provide inspiration for artisans surfing the database. This article was first published in the August issue of Rapaport Magazine.